We’d love your help. Let us know what’s wrong with this preview of Michi Saagiig Nishnaabeg by Doug Williams. To ask other readers questions about Michi Saagiig Nishnaabeg, please sign up. 1) I first met Doug Williams during my brother's political campaign in the Ontario election. Doug was acting an elder of the Michi Saagiig Aboriginal People of Curve Lake, Ontario and giving his blessing to my brother's NDP campaign against the progressive conservatives. He was full of jokes and high spirits and performed a tobacco smudge w/ Andrea Horvath & co. Doug really cares about and is invested in this community. 2) I later ran into Doug Williams on World Turtle Day. There was a exhibition and talk put on by the Kawartha Turtle Conservatory to talk and show turtles and essentially look for volunteers to help their cause. Only about 15 people showed up, but there, sitting in the community center was Doug Williams, asking questions and giving answers about cause/effect and asking for solutions to help out our struggling turtle population. Doug really cares about and is invested in this community. 3) The first time I ever really sat down to talk w/ Doug was in a slightly more academic setting. I was in the conference room at the Holiday Inn and Doug was, in a more academic way (yet still very much himself), talking about archaeological practices within Ontario and their cultural effect on First Nation communities. Doug really cares about and is invested in this community. Chi’miigwech to Doug Williams (Gidigaa Migizi) for this remarkable and enlightening book. I grew up in Lakefield, on Michi Saagiig Nishnaabeg territory, but had never had the opportunity to understand the history of the area and it’s people from an indigenous perspective. The author’s deep knowledge, ability to connect the oral history tradition in parallel to European academic approaches to history, and incredible commitment to researching & recording the history of the Michi Saagiig Nishna Chi’miigwech to Doug Williams (Gidigaa Migizi) for this remarkable and enlightening book. I grew up in Lakefield, on Michi Saagiig Nishnaabeg territory, but had never had the opportunity to understand the history of the area and it’s people from an indigenous perspective. 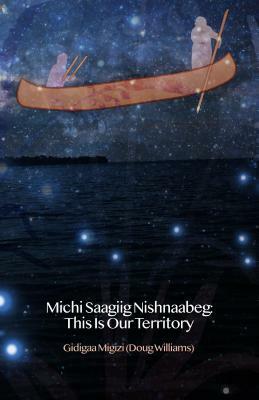 The author’s deep knowledge, ability to connect the oral history tradition in parallel to European academic approaches to history, and incredible commitment to researching & recording the history of the Michi Saagiig Nishnaabeg shine through on every page. Of course I loved the stories about the history of Michi Saagiig Nishnaabeg since I am one. This book is a great resource with so many curriculum connections for k-12. I thought if all kinds of activities to do with the information. Important information for descendants of the Anishinaabek. A must read.